£5 adult / £3 child / £12 family / £4 for 10+/ £2 for school pupils plus booking fee. Fee is £1 per ticket online/phone. 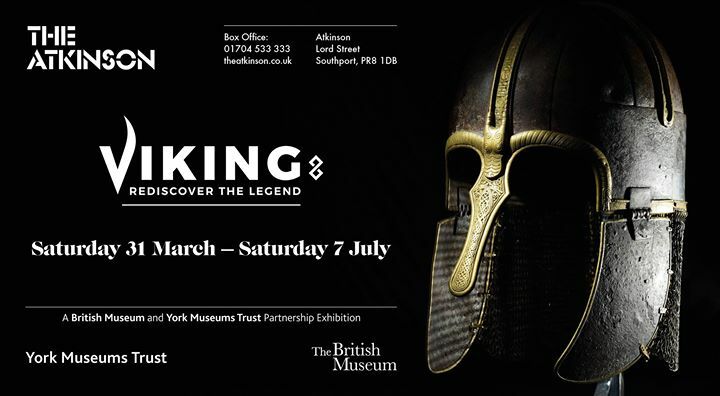 ‘We are delighted to be the only North West venue to be hosting the Viking: Rediscover the Legend exhibition in 2018. The most significant Viking treasure hoards ever discovered in Britain will be on display together for the first time in Southport this April! Star objects from the British Museum will feature alongside the Yorkshire Museum’s world-class collections and will be interpreted in new ways to give a fresh perspective on how Vikings shaped every aspect of their lives in Britain. Also included will be one of the most famous Viking collections in the UK, including the Vale of York Viking Hoard, Cuerdale Hoard and the Bedale Hoard. ‘This is an tremendous exhibition containing a vast array of artefacts and information from Viking Northumbria. Our favourites included the newly cleaned and sparkling Silverdale Hoard and the large penannular brooches from Penrith, the Gilling Sword (which looked like it had been forged yesterday) and the raven pennies minted for Olaf Gufrithson, the Viking King of Dublin, who was defeated at the Battle of Brunanbugh by Aethelstan, King of the West Saxons, in 937 but who retook York on the latter’s death and was minting coins as far south as Derby when he died in 940 There is also an intriguing display of local finds curated by the North West Heritage Group which includes a 3D print out of a local sculptured Scandinavian type stone cross at Anderton, Lancs by The Monuments Men of Leigh’. It was very quiet when I went; none of the jostling as at London exhibitions and you can come and go all day on the one ticket. Worth two or three hours of anyone’s time.